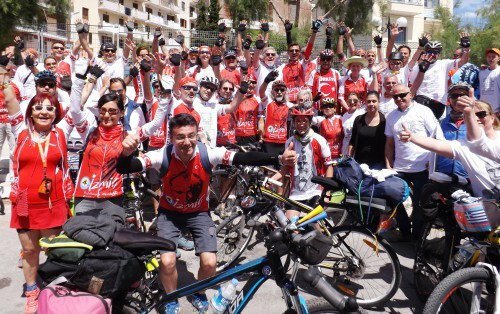 Approximately 100 bikers arrived on Saturday on the island of Lesvos, Greece, from Ayvalık within the framework of the “4th bicycle festival under my pedals” that is held in Izmir. This action aims to strengthen the relations between the bicycle associations from the two sides of the Aegean and is the forerunner of the bike route “Eurovelo” that will link Izmir with Lesvos and Chios. It is a programme held by the European Cyclists’ Federation that aims to promote a high quality network of bicycle routes which connects Europe with 15 long distance cycle routes.